It’s Throwback Thursday so let’s go back through Upper Deck’s trading card history and come up with a fun giveaway. In case you haven’t heard, the Kansas City Royals clinched the American League Wild Card Tuesday night against the Oakland Athletics and man was it a game to watch! Salvador Perez singled home the game-winning run in the12th inning for a thrilling 9-8 victory over the Athletics. 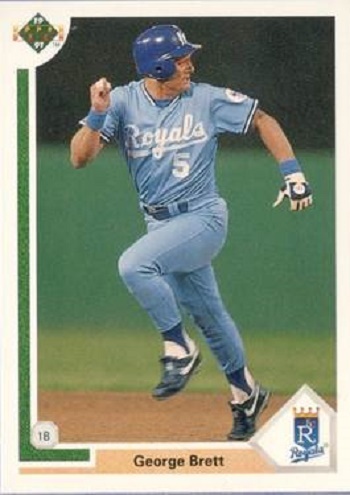 The crowd watched in amazement (including Hall-of-Famer George Brett) at the spectacle that unfolded before their eyes. So let’s put up a throwback card and see if our fans can come up with some great captions for the card! Please share your comical caption to this card for your opportunity to score a complete Upper Deck 25th Anniversary Set! You have until Friday morning, October 3rd at 8:00 a.m. PT to post your caption before this promotion is closed. Can I FINALLY put that Pine Tar incident BEHIND ME? I thought the Green Monster was the name of the wall?! Damn, the Phillie Phanatic is scary! I’m so good I deserve the Heisman too! That umpire wont catch me with a pinetar bat. Oh No, Here comes the kissing bandit I need to get out of here. Pine tar?? Noooo not me!! Uh oh! Satchel Paige is gaining on me! Lost a bet to Bo so I had to do the Heisman pose on my way to third. Is that Morganna the Kissing Bandit? Gotta run! Running out these triples sure isn’t as easy as it used to be!!! C’mon guys, this Kansas City BBQ isn’t going to eat itself! Who let all these Welsh Corgi puppies out on the field??? Red light! Green light! Red light! Greeeee….Red light! am i running the right way?!?! Hey Coach do they still run this way?? If I run fast enough and hit 88mph, maybe I can make the 2014 playoffs in time. Bretter get out of here, they’re looking for my pine tar. Wait, it’s going to take HOW LONG for us to get back into the playoffs? What’s that thing? Usually that ball is out of the park! Get that pine tar away from me! I am a Bretter base runner than you! Sorry, I gotta go! Upper Deck’s latest release just arrived at the card shop! Hey Bo I can pose the Heisman too! Look both ways before crossing…all clear! You guys, LETS GO! The pizza rolls are ready!!!!!! What do you mean stop you smell pine tar?